Our range of audio and entertainment options will enable you to listen to your favourite music or watch a film whilst relaxing in the hot tub, making your spa experience the most relaxing and enjoyable it can be. The awesome Canadian manufactured Gecko In.stream 2 Bluetooth audio amplifier system is fitted as standard on all Prestige and Starlight Spas and can be fitted as an optional extra on Urban Lite and Heritage spa ranges. Coupled with two 50w shell mounted transducers and a separately mounted subwoofer, the In.stream 2 audio system transforms the hot tub shell into a huge speaker for great in-spa sounds. 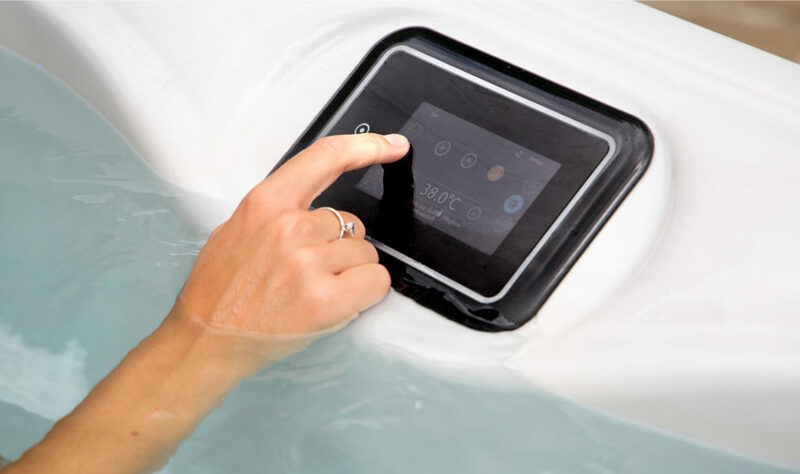 It’s easy to connect your phone or device by Bluetooth to the In.stream 2 System in your spa, whilst leaving your phone or device well away from the wet area. Control your music volume and track selection from the Intuitive Gecko bar top keypad with touch screen colour display. 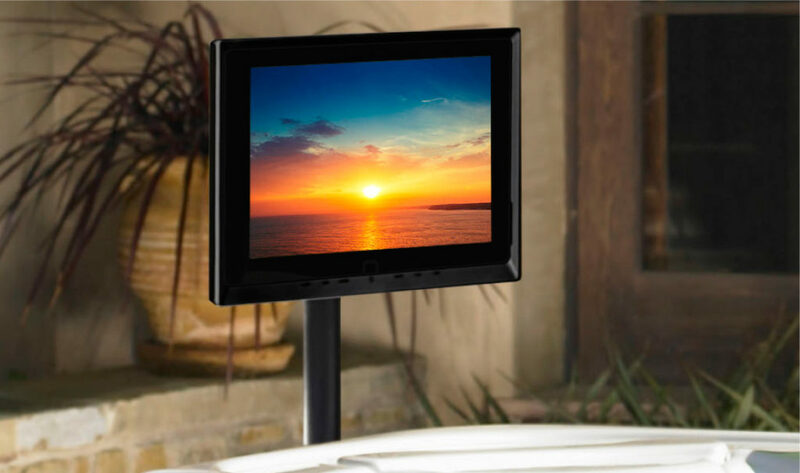 Our waterproof TV monitor system is designed for spa installation and allows you to enjoy video entertainment in the comfort of your own garden, whatever the weather. The TV is fixed to the spa with a heavy-duty steel mounting and the all-weather design protects the LCD TV from rain, dirt, insects, scratches and extreme temperatures. When not in use, you can further protect the TV with the waterproof, colour matched heavy duty vinyl cover. Standard TV monitors do not operate well when situated in a hot tub; hot, moist air with chlorine and ozone attack the monitor and greatly reduce equipment life. This is not a problem for the Riptide TV monitor as it is specially designed to live outside the spa on the cabinet and cannot be harmed by rain, frost or sunshine. The monitor can be swiveled on its stand so it can be viewed from most spa seats. 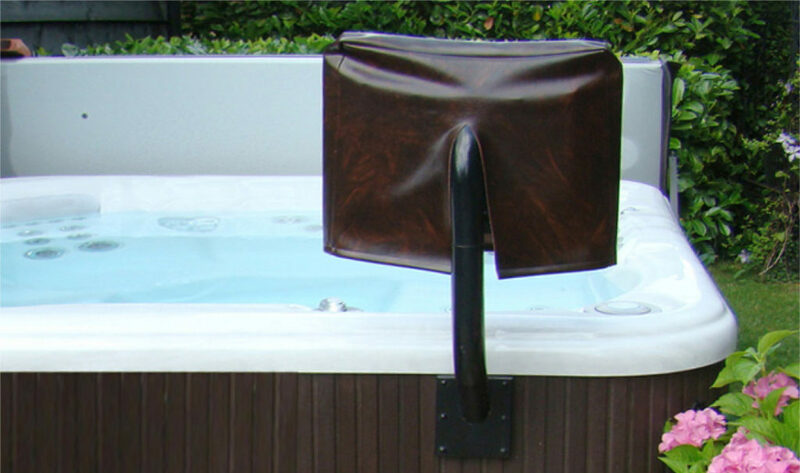 Traditional pop-up speakers situated within the hot tub can be affected by chlorine and ozone and often fail. Riptide speakers, however, are bonded to the spa shell inside the spa cabinet away from the chlorine and ozone and will last for the lifetime of your spa. Our transducer speakers have fantastic sound, and when used in conjunction with the subwoofer, make for perfect listening. Pop-up or speakers mounted in the cabinet are often an irritation for neighbours. With our shell mounted transducers the sound is directed inside the spa to the bathers, thus reducing external sound.